SHOP NOW-SHIP LATER - Use this option so you don’t miss any special occasions. Simply enter the date you would like your gift to be delivered in the Shop Now-Ship Later” box when checking out and we will target that date for your delivery. This is a free service. 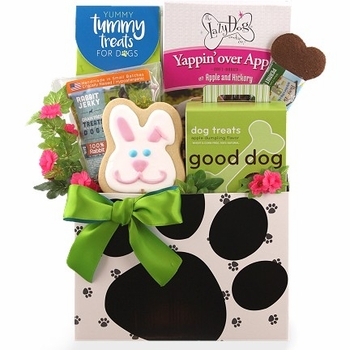 Share your love this Easter with your special canine friend. Pooches everywhere love to celebrate and especially LOVE it when there’s gourmet biscuits involved! So you can count on lots and lots of gourmet dog biscuits in this special Easter dog gift. Biscuits of different shapes, sizes and even flavors. Be sure to check out our detail’s tab for a list of everything included inside.